13 Gloucester is located on the east side of Gloucester, between Marlborough and Commonwealth, with 11 Gloucester to the north and 15 Gloucester to the south. 13 Gloucester was designed by architect Willard Thomas Sears (of the firm of Cummings and Sears) and built for him ca. 1872, one of four contiguous houses (9-11-13-15 Gloucester) designed as two symmetrical pairs united by an uninterrupted mansard roof. At about the same time, he also designed 322 Marlborough on the adjoining lot to the east. Click here for an index to the deeds for 13 Gloucester. By 1875, 13 Gloucester was the home of Edward Henshaw, a wholesale dealer in leather findings, and his wife, Frances (Simmons) Henshaw. They previously had lived at 1 Exeter. 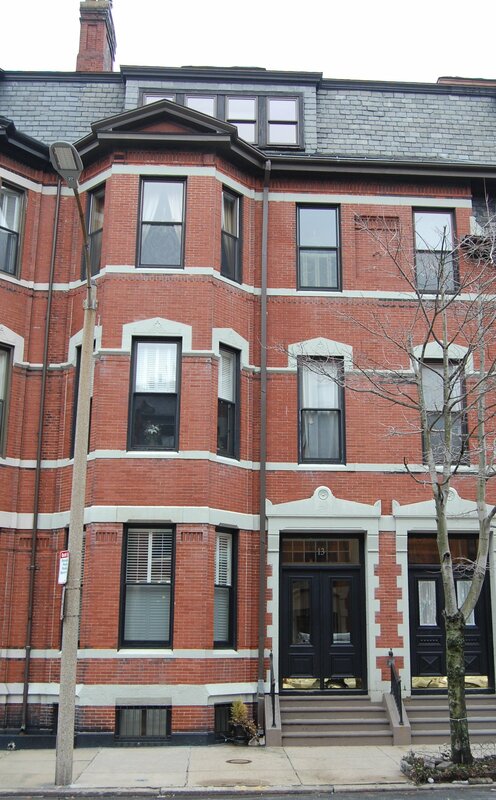 The Henshaws continued to live at 13 Gloucester during the 1882-1883 winter season, after which they moved to 310 Shawmut. By the 1883-1884 winter season, 13 Gloucester was the home of attorney Arthur Lincoln and his wife, Serafina (Loring) Lincoln. They had married in December of 1883 and 13 Gloucester probably was their first home together. They also maintained a home in Hingham. Arthur Lincoln died in December of 1902. Serafina Lincoln and their daughter, Serita, moved soon thereafter to 302 Marlborough. By the 1903-1904 winter season, 13 Gloucester was the home of stockbroker Charles Boyden, Jr., and his wife, Harriet Howard (Ely) Boyden. They had married in April of 1903 and 13 Gloucester probably was their first home together. They continued to live there during the 1906-1907 season, but moved thereafter to 230 Commonwealth. On March 18, 1907, 13 Gloucester was purchased from the estate of Joshua Montgomery Sears (who had died in June of 1905) by attorney Joseph Sargent, Jr. He and his wife, Constance (Carryl) Sargent, made it their home. They previously had lived at The Colonial at 382 Commonwealth. They continued to live at 13 Gloucester during the 1909-1910 season, but moved thereafter to The Imperial at 308-310 Commonwealth. On June 24, 1910, 13 Gloucester was purchased from Joseph Sargent by Mary (Dean) Tufts, the wife of lead manufacturer Walter Tufts. They previously had lived at The Graffam at 330 Dartmouth. Walter and Mary Tufts spent the winter of 1916-1917 in California and 13 Gloucester was the home of wool merchant Robert Hooper Stevenson, Jr., and his wife, Alice Lee (Thomas) Stevenson. They had married in November of 1916 and 13 Gloucester probably was their first home together. 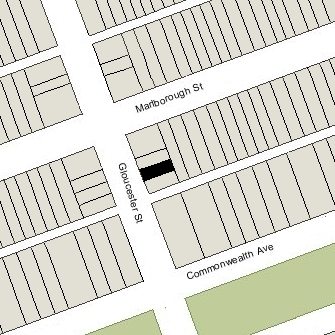 By the 1917-1918 winter season, they had moved to 118 Marlborough. After returning from California, the Tuftses resumed living at 13 Gloucester. He died in February of 1924, and Mary Tufts continued to live there during the 1924-1925 winter season, but moved thereafter. She continued to own the house and lease it to others. During the 1925-1926 winter season, 13 Gloucester was the home of Rev. George Grenville (Greenville) Merrill and his wife, Pauline Georgine Warren (Dresser) Merrill. They previously had lived in Stockbridge, Massachusetts, where he had served as rector of St. Paul’s Episcopal Church until his retirement in 1923. They continued to maintain a home in Stockbridge and also a home, Merrillton, in Newport. By the 1926-1927 season, they had moved to 381 Commonwealth. During the 1926-1927 winter season, 13 Gloucester was the home of Marietta (Shea) Reece Thomas, the widow of John Reece, inventor of the button hole sewing machine, and of John Babson Thomas, a real estate broker and investor. In 1925, she and her second husband had lived at 20 Hereford (he died in April of 1925). By the 1927-1928 season, Mrs. Thomas had moved to The Gloucester at 8 Gloucester. During the 1927-1928 winter season, 13 Gloucester was the home of Ethel (Whiting) Otis, the widow of Herbert Foster Otis, and their daughter, Mary Otis. They previously had lived at 9 Hereford. She also maintained a home in Nahant. They had moved from 13 Gloucester by the 1928=1929 season. In 1930 (at the time of the US Census), they were were living in Montecito, California, and by the 1930-1931 winter season, they were living at 239 Marlborough. During the 1928-1929 winter season, 13 Gloucester was the home of Robert Shuman Steinert and his wife, Lucy (Currier) Steinert. The previous season, they had lived with Lucy Steinert’s parents, Guy and Marie (Burress) Currier, at 8 Commonwealth, and also at 486 Beacon. They also maintained a home in Beverly Farms. Robert Steinert was president of M. Steinert & Sons, piano and music dealers, on Boylston, and of the Jewett Piano Company, manufacturers of pianos. By the 1929-1930 season, the Steinerts had moved to 75 Mt. Vernon, and by the 1930-1931 season were living at 128 Commonwealth. During the 1929-1930 winter season, 13 Gloucester was the home Gordon Abbott, Jr., and his wife, Esther Lowell (Cunningham) Abbott. They previously had lived in an apartment at 250 Beacon. They also maintained a home in Manchester. Gordon Abbott was a banker and, after World War II, owned and operated a construction company. By the 1930-1931 season, the Abbotts had moved to Brookline, and by the 1933-1934 season, they were living at 167 Marlborough. 13 Gloucester was not listed in the 1931 and 1932 Blue Books and was shown as vacant in the 1930-1931 City Directories. By 1931, it was the home of William Jay McKenna and his wife, Isoline Orne (Campbell) McKenna. They had lived at 187 Beacon in 1930. He was president of Henry Woods Sons Company, makers of dry colors. By the 1932-1933 winter season, 13 Gloucester was the home of George Robinson Hall and his wife, Isabel (Plunkett) Hall. George Hall and his family had owned the Adams House Hotel on Washington Street until late 1925. On December 18, 1932, 13 Gloucester suffered a fire in the basement from an overheated furnace. 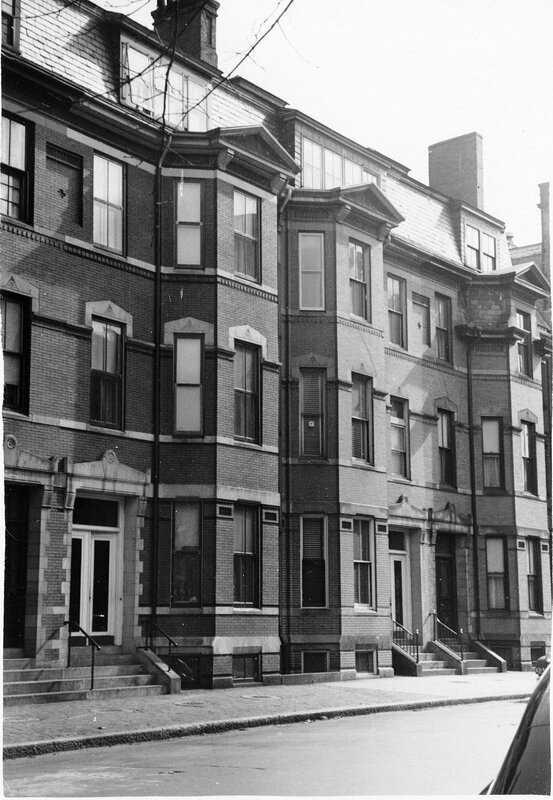 The Halls continued to live there during the 1934-1935 season, but moved thereafter to an apartment at 308 Commonwealth. On September 29, 1936, 13 Gloucester was purchased from Mary Tufts by Genevieve V. (Mahoney) Berghaus, the wife of Theodore Francis Berghaus, a realtor. In August of 1936, prior to finalizing their purchase of the property, they Berghauses applied for (and subsequently received) permission to convert it from a single-family dwelling into four apartments. After the conversion was completed, they lived in one of the apartments. They previously had lived in Roslindale. The Berghauses continued to live at 13 Gloucester until about 1941, when they moved to 180 Marlborough, which they converted into a lodging house. Genevieve Berghaus continued to own 13 Gloucester. On December 8, 1948, Genevieve Berghaus transferred the property into her and her husband’s names. On April 15, 1976, 13 Gloucester was acquired from the Berghauses (by then residents of West Palm Beach, Florida) by Julius R. Cavadi. He also owned 15 Gloucester, which he had acquired i July of 1975 through a mortgage foreclosure. On June 15, 1976, 13 Gloucester and 15 Gloucester were purchased from Julius Cavadi by Michael Geller, Keevin Geller, and John B. Wise, co-partners doing business as 13-15 Gloucester Street Associates. 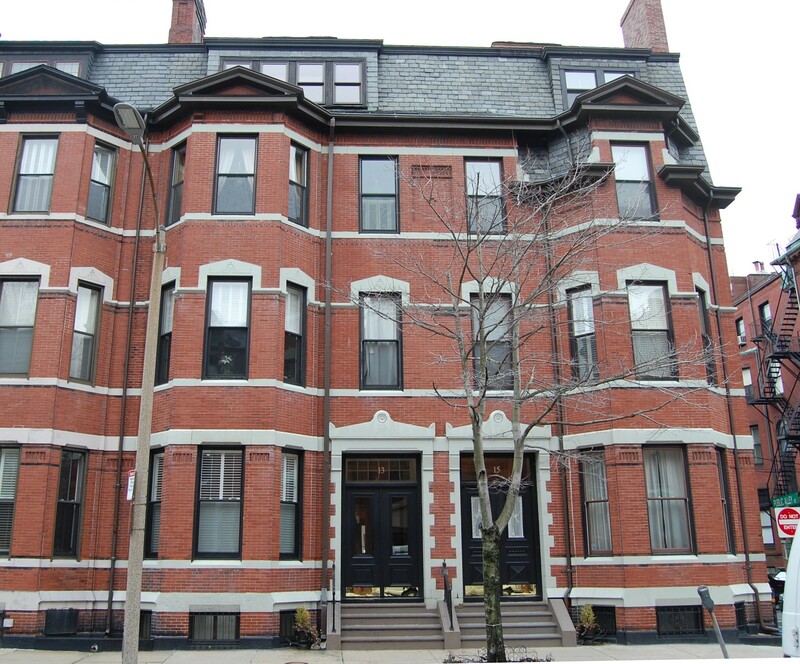 On September 21, 1976, they converted both properties into condominium units, with four units in each house, the 13-15 Gloucester Street Condominium.